Dunleer Hardware Ltd. is one of the leading Builders Merchants and DIY stores in the North East and are members of the Homevalue buying group. Due to continued growth we now require the following people for our team. A good knowledge of general building materials and the DIY trade or relevant experience in a similar type role would be desirable. Your role will be customer facing and you will need to have excellent communication skills. The person we require will have a good understanding of all aspect of plumbing and heating, experience in trade sales will be an advantage. Your role will be customer facing and you will need to have excellent communication skills. The person required will have experience working in a warehouse/store environment with forklift experience. The team members we require should have good computer skills, communication skills and a proven ability of being able to organise their time in a busy work environment. 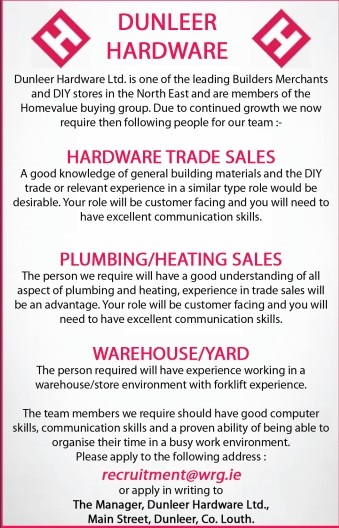 Please apply to the following address recruitment@wrg.ie or apply in writing to The Manager, Dunleer Hardware Ltd, Dunleer, Co. Louth.